My time is being stretched in many directions–custom projects, donor requests, beginning iPhone app development, and working on my own trading skills. This post is one focused on my recent trading thoughts. First, an unsolicited testimonial. I’ve been part of Richard Todd’s Move the Markets Team for a while now. I find it to be incredibly valuable. If you are looking for a community of experienced traders that are serious about improvement, both of themselves and of newer members, look no further. I recommend it highly. There are a lot of free areas to start with, and if you want to go deeper, he charges a modest monthly fee for full access. The most important thing is to identify when the markets are likely to trend, and then to apply a trend-following setup (buy a pullback in a trend, buy a breakout, etc.) or sit out. Conversely, identify when the markets are choppy and listless, and apply a range-bound setup or sit out. I have demolished myself in the past two Augusts by playing dummy trades (trend continuation) in a seasonally flat and choppy market. I get stuck in the trap of obsessing over the entry, target and stop parameters, so I needed this reminder to get back on track. 1. Become proficient in identifying chop and trends after the fact. This one should be relatively self evident. 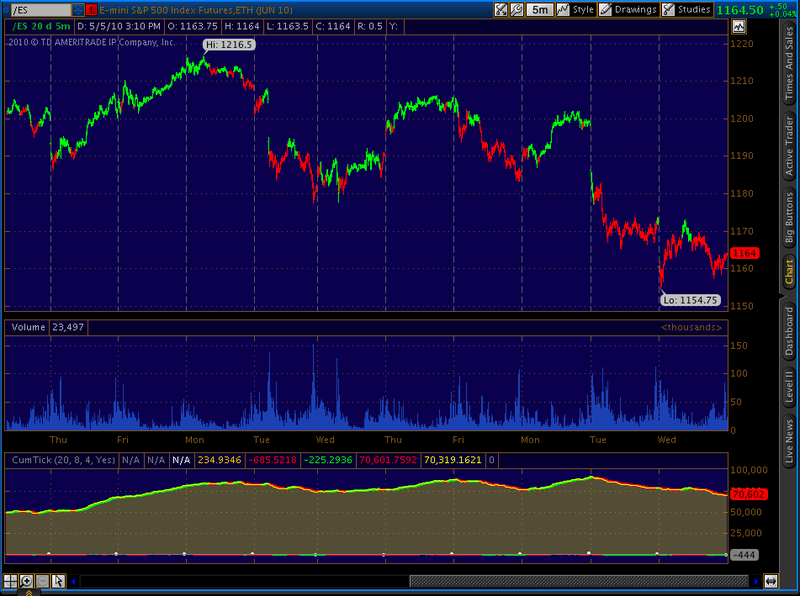 Look at the day’s chart after the close, and annotate where the trends were, and where the chop was. Continue to do this on intraday charts until you can do it instantly and effortlessly. 2. 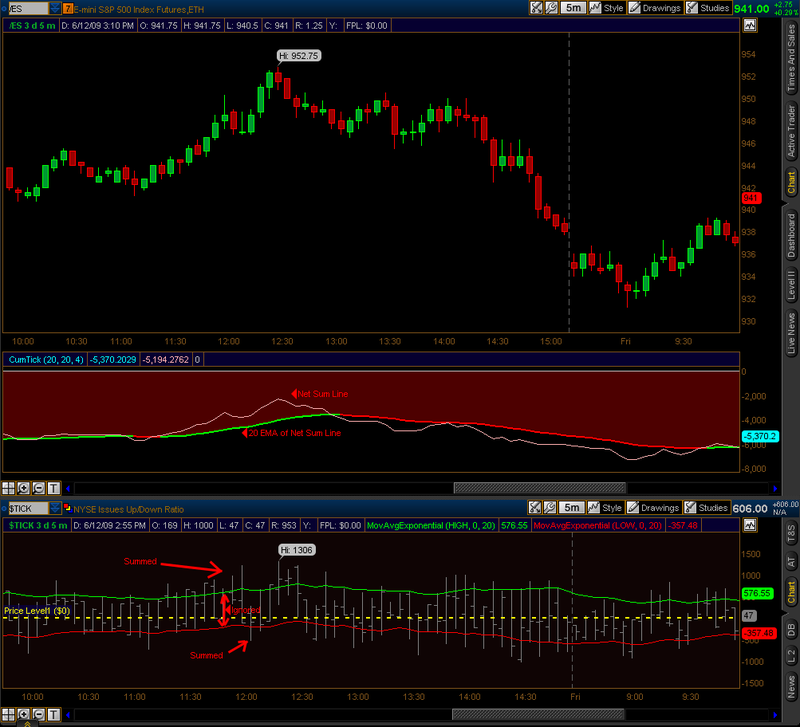 Go to live data and practice identifying whether the market is in a trend or in chop RIGHT NOW. Don’t worry about if the market is going to keep trending or keep chopping. Just correctly identify what it is currently doing. Continue until you can do it instantly and effortlessly. 3. The last step is to start to try to predict what is likely to happen next during the day. Will the trend be likely to continue? Will the range probably be broken? Many things can give clues to this including volume, time of day, support/resistance levels, tape speed, pending news announcements, and so forth. Along the way you should also gain the skill of predicting whether a trading day may be trending or choppy before the day begins, and also knowing what events and price levels would imply a change to that prediction. This one can take years of screen time to become proficient. Patience and work are needed! I have started to notice myself having the beginnings of this skill. I can only chalk it up to screen time. Watching what has worked, what has failed and what has generally happened in the past. Feeding years of price data into the most complicated neural network there is: the human brain. Note that in all of these things, I have mentioned words such as “likely to continue” and “probably”. None of this is an exact, deterministic science! You also have to be able to think, make decisions and accept outcomes probabilistically. That means that the specific outcome of any one event does not determine whether a probabilistic decision was the right one or not! In a deterministic situation, the outcome judges the decision. Gravity always pulls you down to the earth, 100% of the time. Jumping off a cliff is always a bad idea, because you will always plunge to the bottom. In a probabilistic situation, it’s the odds up front and the information you had at decision time that say whether a decision was the right call or not. The odds will play out to a degree of “rightness” in the long run, even though you may be taking a beating in the short run. This way of thinking is very difficult for many to attain, including myself. My Outcome Simulator is one tool that can help. The excellent book Trading in the Zone: Master the Market with Confidence, Discipline and a Winning Attitude by Mark Douglas is another good resource. But unless you are hard-wired this way, and most of us aren’t I would imagine, this takes PRACTICE. 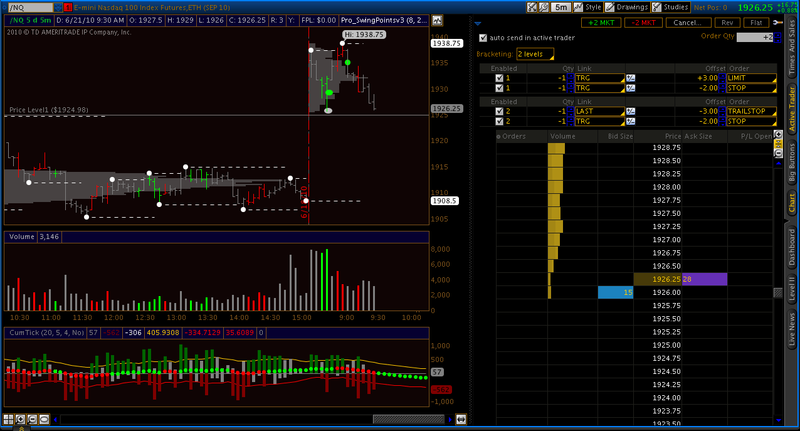 I bought the gap fill on a tick downspike (gray oval). The tick downspike is the entry signal, but the reason for the trade is the context: I didn’t buy the first downspike because we were still in space over the gap. The second tick downspike was the first retrace to yesterday’s high. Also, a strong opening gap = bullish tones for the morning, so that said to fade the downspike, not go short. I expected a bounce, and we got it, all the way to new highs, even! Opening gaps that clear the prior day’s highs and lows are typically strong. Gaps inside the prior day’s range are less so. Back to the trade: Ended up “buying” 1 tick above the day’s low so far (!) I traded 2 contracts, both with a 2 point initial stop. One I “sold” after a 3 point target (first green oval) and the other I put on a 3 point trailing stop and “sold” much higher (second green oval). Net +12.5 “points”. 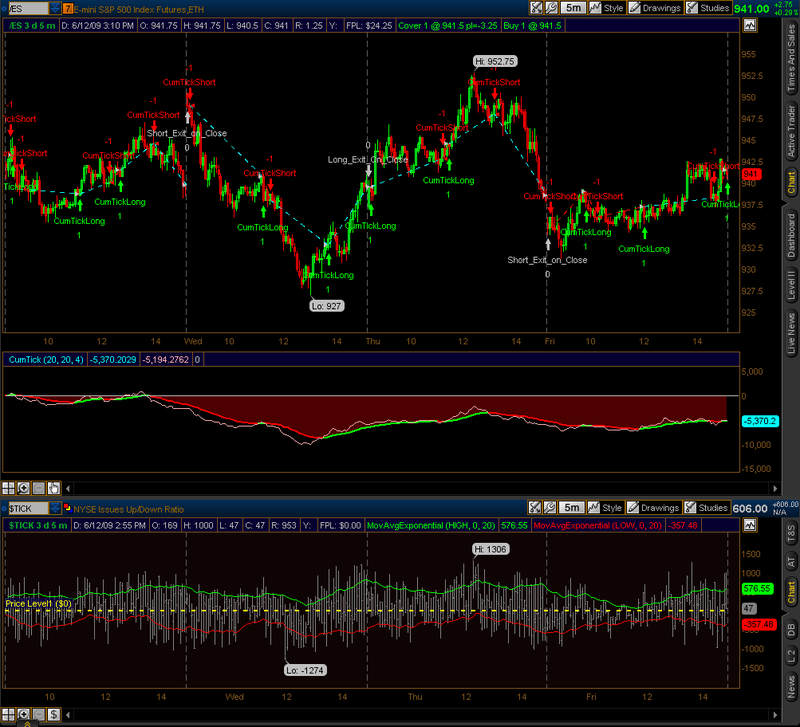 I’ll be posting more charts and a modified cumulative tick indicator sometime over the next week. I’ll also be working on my market context skills, because that is the only effective way to minimize your losing trades, and is the foundation to using a setup in the right way. My ultimate goal is to choose a trending setup and a chop fade setup, know when to use them, and then consistently apply them, accepting the outcomes as they happen. That should be my last hurdle to arrive at net profitability. It’s been a long, hard journey, but I think I can see the oasis from here!